Normally when you think of repurposing leftover risotto, arancini, those little fried balls of day-old risotto coated in bread-crumbs, come to mind. But it's a rare day when I feel compelled to fry anything, and the inspiration for these little baked cakes comes instead from Ilva at Lucullian Delights and her recent Soft Rice Cakes with Onion, Goat's Cheese and Thyme. Ilva cooks a risotto rice specifically for the purpose, but I decided to use her brilliant idea of shaping cooked rice (in my case, risotto already flavored with peas and mint) into little patties to be baked. 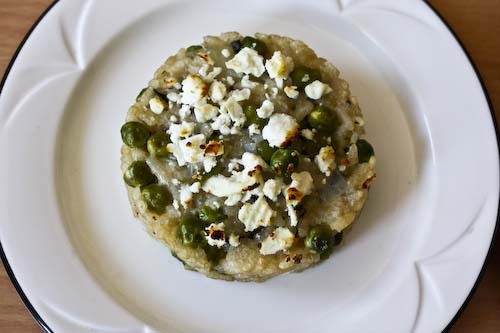 I simply topped my risotto cakes, once they had been brushed with the slightest hint of olive oil, with a few crumbles of feta. The rice baked up crispy on the edges, and if there's anything better than cheese baked to a brown crustiness, I don't know about it. R liked the risotto made this way even better than its initial incarnation. After a day in the fridge, the flavors had intensified, to leave us with something so much better than merely leftovers. Lightly grease a baking sheet. Place a circular cookie cutter on the baking sheet and fill with risotto. Mash the risotto down a bit with the back of a spoon so you're left with a fairly dense patty of about 2" in thickness. Carefully remove the ring, and top your patties with a bit of the feta. Repeat as needed until you've used up all of your leftover risotto. Bake in the oven for about 8 - 10 minutes, until warmed through. Then place under the broiler for about 2 minutes, in order to brown the cheese. Transfer the cakes to a plate and serve. These cakes are perfection. what a creative use of leftover risotto. Well done. Beautiful cake Andrea, such a creative way to use leftover risotto. this looks so pretty. a great way to use up leftovers. peas and mint go so well together! 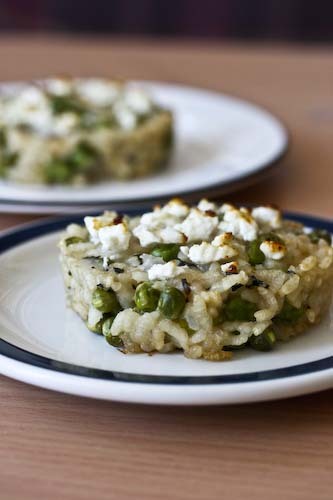 What a great idea, and I love the feta with the peas--too bad there's never any leftover risotto in our house! Perfect cake. Mouth watering. Nice click. I hardly ever have leftovers in my house but these look so good it would be worth making the risotto especially for them. I love that you baked the cakes. That experiment turned out pretty well! looks awesome. Jacques Torres sometimes soon? 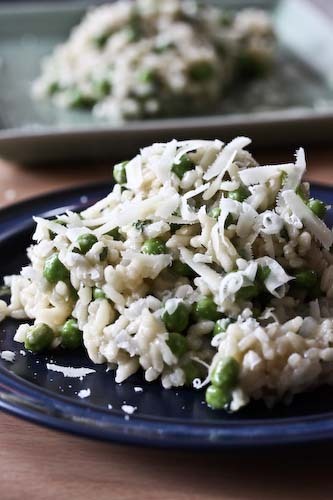 Great way to use up your leftover risotto! I can see how all those flavors would intensify beautifully in this cake version. And the baked cheese really takes it up a notch!